Millions of years ago, beneath a mountain plateau on a planet in a distant galaxy, a group of Alterans debate how to prevent a war with their fellow Alterans — the fanatical Ori. One device — the Ark of Truth — could make people believe the truth as the Alterans see it. Amelius, creator of the Ark, has programmed it with the truth about the Ori. Some argue, however, that use of the Ark would be a denial of their opponents’ free will and as morally repugnant as physical bloodshed. It is a brainwashing device, and would make the Alterans no different from the Ori, forcing their beliefs upon others. Rather than fight, the Alterans choose to leave this galaxy. The Alterans’ concealed spaceship blasts off, burying the cavern and the Ark beneath tons of rubble. 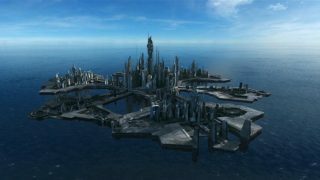 In the present day, Dr. Daniel Jackson and SG-1 have been searching for the Ark amid the ruins of the planet Dakara, the first landing place of the Alterans when they arrived in the Milky Way. Daniel locates a chest bearing inscriptions in an Ancient dialect older than any he’s seen. Impatient, as always, Vala Mal Doran exhorts him to rip off the lid. Just as Jackson explains that it’s sealed, Lt. Colonel Cameron Mitchell radios in. They are under fire. Ori troops, commanded by Vala’s husband, Tomin (“Crusade”), force Mitchell and Lt. Colonel Samantha Carter to fall back to the position where Jackson is examining the chest. Tomin’s army has them cornered, but he promises to spare them — and SG-1 surrenders. The Prior from Ver Eger (“Origin”) joins them. Ignoring Jackson’s warnings about the potential danger of the chest’s contents, the Prior has Tomin blast it open. Only a crumbling papyrus lies within. The Prior orders SG-1 killed, but Tomin protests. When he is unable to use his special abilities, the team reveals a concealed Prior inhibitor. Enraged, the Prior grabs for Tomin’s staff weapon and in the ensuing scuffle, Mitchell kills the Prior. The Ori troops surrender and are taken back to Stargate Command. Mitchell accompanies Major General Hank Landry to his office, relaying Tomin’s fear that a coordinated attack on Earth may be imminent. Waiting there is the new I.O.A. representative, James Marrick. A former CIA/black ops agent, Marrick insists on interrogating Tomin, despite his having been debriefed by SG-1. Is Tomin to be treated as defector requesting asylum, or a prisoner of war? Tomin grapples with the possibility that the ascended Ori themselves were likely destroyed by Merlin’s weapon (“The Shroud”), leaving only their human followers to fight a meaningless war in their name. Jackson confides that he has been having visions of an exploding mountain and the “Armeria Verimas” – the Ark of Truth, which SG-1 has been searching for. Brainwashing the Priors and the human followers of the Ori may be they only way to stop their brutal, bloody crusade across the Milky Way Galaxy. The Book of Origin contains a story similar to Jackson’s visions. Ortus Mallum, the birthplace of all evil according to Origin, is a mountain which erupted. Tomin agrees to help SG-1 search for the Ark by contacting the anti-Ori underground. Mitchell takes command of the Odyssey on a special mission into the Ori’s home galaxy to find the Ark. Should that fail, they will attempt to destroy the Supergate (“Camelot”) by placing four Mark IX’s between the gate’s segments. Marrick will be on board overseeing the operation. So with the future of the galaxy in the balance, the Odyssey travels through the massive gate into the Ori galaxy. With his world turned upside down and Marrick’s reminder of the atrocities he has committed, Tomin is deeply troubled. Teal’c, having walked the same path, offers Tomin insight on how to continue living. Millions of innocent lives can still be saved by not giving into self-pity, but fighting on. Guided by Teal’c hard-won wisdom, Tomin quickly locates Hertis, head of the resistance. Many believe the fires of Celestis — the seat of the Ori themselves — have gone out. After a ride on the Odyssey, Hertis tells them that Ortus Mallum borders the plains of Celestis on the Ori home world (“Origin”). The site has been searched many times by the Priors and those seeking proof to refute them. Jackson suspects the Ark may still be safely hidden there. Furious that he was not informed of Hertis’s presence, Marrick confronts Mitchell. The I.O.A. believes the attempt to locate the Ark is a fool’s mission. But Cameron stands up to him, and Marrick backs down … for the time being. Once in cloaked orbit around Celestis, SG-1 and Tomin beam down to search for the Ark. Marrick immediately barricades himself in Odyssey‘s Asgard core room (“Unending”). By the time Major Marks alerts Mitchell, Marrick has replaced a command crystal with one of his own. While the others continue their search, Carter and Mitchell beam up to find out what he is up to. Carter soon has the core’s door open. Marrick stands smugly aside as the ship’s matter converter manufactures a Replicator bug. Since the S.G.C. would not destroy the Supergate, he is implementing the I.O.A.’s back-up plan to prevent more Ori ships from entering the Milky Way — bringing the virtually unstoppable enemy into their galaxy. Operating the core will lure Ori ships close enough to beam aboard the destructive Replicators. Now, in addition to finding the Ark of Truth and ending the Ori conflict, SG-1 has to fight another enemy on a second front. Anti-Replicator guns fails to disable the spider-like technology, and Marrick reveals that the I.O.A.’s research has enabled them to program out this susceptibility. The Replicator skitters off, and Mitchell confines Marrick to the brig. Suspecting there must be a shut-down command, Carter begins a cyber-hunt. This means the core must remain active, rendering the Odyssey vulnerable to detection by Ori ships while inside enemy territory. Deciding they’d be safer in hyperspace, Mitchell intends to beam up the ground team. The Replicator interferes. Carter shifts her attention to regaining control of vital systems, and Mitchell sets off to hunt the Replicator. On the planet below, the fruitless search continues until Jackson has another vision. Directed to a hidden, underground staircase by the form of Merlin himself, they descend. This is the cavern where the Ark has remained since the Alterans abandoned it. They haul it to the surface, calling for beam up. The Odyssey, however, has jumped into hyperspace to avoid the four Ori warships that have found them. Mitchell kills one Replicator only to discover that there are already more. Carter instructs him to locate the queen, which he does. She doesn’t want it destroyed yet, in case they need a distraction when the Replicators come for the core. The core’s doors are welded shut. A heavily armed team is stationed outside. The Replicators come first, however, for Marrick. They convert him into a human-Replicator hybrid, searching his mind for the self-destruct code. As Marks and Carter search the Asgard core for a disassemble code, Replicator-Marrick engages Mitchell in combat. Carter discovers there is no shut down command, and begins writing one. Meanwhile, the Replicators attack the core. On the ground, Ori soldiers attack Daniel, Vala, Teal’c and Tomin, and seize the Ark. They leave Teal’c for dead but take the others, throwing them into individual cells where they are tortured by the Doci and his Priors. When Teal’c awakens, he cannot locate his team mates or raise the Odyssey. He staggers to his feet, and despite a painful wound begins the arduous walk over snow-covered mountains and down to the city of Celestis. On the mud flats within sight of the city, he collapses. An ethereal hand heals his wound — an ascended being who is surreptitiously helping SG-1. Teal’c rises again, running toward the city with renewed energy. Vala has been taken to an ornately decorated room, where the Priors have placed the Ark on a wooden table. A large Ori symbol on the wall is surrounded by flames, but does not burn up. Adria, Vala’s daughter and herself now a powerful ascended being (“Dominion”), emerges from the fire. She tells her mother that Merlin’s weapon did indeed work. So, when she ascended, she was the only surviving Ori. Now, all the power that flows from Ori worshipers (“The Fourth Horseman, Part 1”) is hers. Once she destroys the Ancients, she will be a being of unchallengeable power — a true god, she says. Vala realizes Adria can’t use the Ark because it can only be programmed to make people believe what is true, not the rantings of a spoiled brat with a god complex. Just as suddenly as she appeared, Adria disappears again. Her attention is drawn to Earth. Calling in from P6X-437, Lt. Colonel Reynolds has been contacted by the one-eyed Prior, who wants to preach the Ori message of salvation to Earth. After appropriate precautions are taken, the Prior is allowed to gate to the S.G.C. General Landry confronts him, telling him his message would not be listened to. He believes this visit is a move of desperation because they know they can’t defeat Earth. But seven Ori ships surround Earth. Lt. Colonel Ellis aboard the Apollo notes that his vessel and the Ancient weapons platform in Antarctica are no match for this many Ori ships. Landry is prepared for the fight, but he hasn’t lost faith in SG-1. SG-1, however, is struggling. In pain from the torture, Daniel Jackson lies on the cold, stone floor. Merlin’s apparition suddenly appears, exhorting him not to give up. Tired of the game, Jackson tells Morgan Le Fay to drop the Merlin guise — that she must do more, that the Ancients must do more. Morgan (“The Pegasus Project”) admits that Adria is too powerful for her to take on directly. She wants Jackson to use the Ark. Converting even one Prior will convert them all, as they are linked by the crystals in their staffs. As Jackson wonders what more he can do, Teal’c, disguised as an Ori soldier, appears outside his cell. On the Odyssey, Carter writes a shut-down program even as she and Marks fend off the Replicators that have breached the core room. The Replicators have also managed to drop the ship out of hyperspace, leaving them open to attack from the pursuing Ori warships. Mitchell is struggling, too, in his fight with Replicator-Marrick. He finally manages to pull the Replicator plug-in from the man’s brain stem. With a moment of control restored, Marrick begs Cameron to kill him. He tells him the Replicators’ self-destruct code is on the back of the crystal he installed in the core’s motherboard. Mitchell finally manages to blow up the queen. Replicator-Marrick, his flesh burned away by the explosion and his skeleton now all Replicator, advances toward the battered Mitchell. Locating the appropriate code, Carter issues the disassemble order. Every Replicator on the ship falls to pieces — but the Ori ships are still attacking the Odyssey. Carter works on the hyperdrive as Mitchell drags himself to the bridge. The Ori vessels ignore Mitchell’s attempts to surrender and bear down on them. Left alone by Adria’s hasty departure, Vala quickly finds keys and locates the barely-conscious Tomin. As she tries to get him to his feet to search for Daniel, he and Teal’c turn up. They race to the Hall of Flames where the Ark rests. 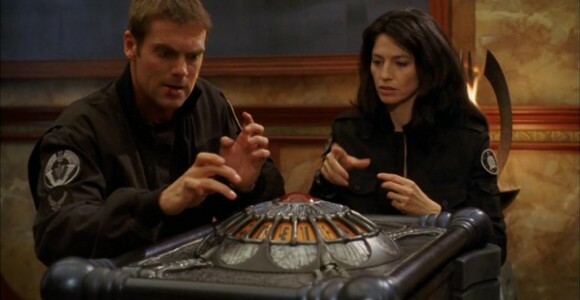 Vala tries to recall which seven symbols on the lid were glowing when Adria left. Jackson keys in “verimas,” the word “truth” in Ancient. Nothing happens. The Doci himself enters, and Adria returns. Vala tries to divert her daughter, and Daniel keys in another guess. Adria flings him against the wall, but Teal’c shoots out the leg of the table holding the Ark. It falls, opening and bathing the Doci in a beam of light. The truth about the Ori, programmed by the Alterans millions of years ago, is reflected to all other Priors via their staffs — and instantly transmitted to all the humans near them, on planets and ships throughout the galaxy. In space, the four Ori ships stop firing on the Odyssey. Stricken, Adria lashes out as Morgan Le Fay sweeps into the room. The two are evenly matched now that Adria has been stripped of her followers and the psychic power they give her. Morgan confronts Adria, engaging her just as Oma Desala engaged Anubis (“Threads”). The two disappear through the ceiling, the ascended beings apparently locked in mortal combat for all eternity. Returning to the S.G.C. with the Ark, Daniel, Teal’c and Landry expose the one-eyed Prior. Through him, the other Ori followers in the Milky Way learn the truth and abandon the fight. While Mitchell recovers in the infirmary, Jackson argues with Landry about the danger the Ark poses — but the I.O.A. wants it studied at Area 51. Vala, meanwhile, has decided to stay with SG-1. She hopes to atone for her mistakes. Tomin, who still believes in Origin, realizes his future lies in trying to help others who followed the Ori. In putting to right the devastation he caused, he, too, will seek atonement. Ready for adventure in a galaxy that, for the first time in memory is bereft of a big, bad guy, SG-1 suits up. They head for the gate and whatever adventure awaits them on P3K-546. Filming on The Ark of Truth began April 15, 2007. The production budget was about $7 million, according to Multichannel News. A typical (44-minute) episode of Stargate SG-1 runs about $2 million. Actress Alisen Down, the Alteran woman who interacts with Ark inventor Amelius, played Stargate Command’s Dr. Brightman in SG-1‘s eighth season. Morris Chapdelaine can be briefly seen at film’s end as one of the Priors. This Prior previously appeared in Season Nine’s “Arthur’s Mantle.” Chapdelaine also played the alien Tenat, and is one of Stargate‘s Asgard puppeteers. Nicholas Podbrey, another Prior, has also been an Asgard puppeteer and a special effects makeup coordinator on Stargate SG-1 and Stargate Atlantis. VOTE! How would you rate "Stargate: The Ark of Truth?"